Ah the old "What's in your backpack?" question. I get asked about this a fair amount, even when I'm not in the woods--especially when people see me pulling out useful stuff. So this will be a short, sweet, and fairly straight forward answer to that question. The only context is that this is my daypack/EDC, or in other words, what I carry with me on "normal" days. You know, like to and from work, or on day hikes or walks around town. Yep, same backpack, and mostly the same gear. The only things that change are a bit of clothing depending on the season, and whatever book I am reading at the time. So here we go. 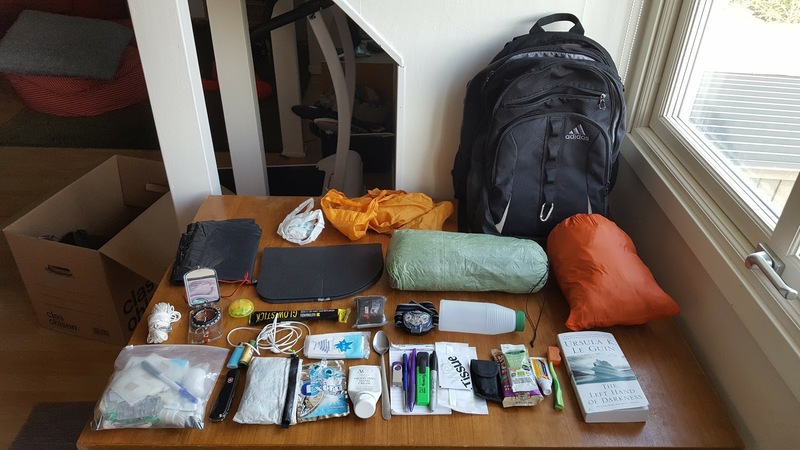 Check out the picture above, and you'll see everything I keep in my pack all laid out. I will soon begin with the bottom row of stuff then move to the stuff on top. But first let's start with the pack itself, just your run-of-the-mill urban type backpack that people use for school or light travel. I suggest getting something with a water resistant or waterproof bottom, and of course something durable and somewhat lightweight. Now on to the contents of the pack. 1. (Bottom left) A first aid kit (FAK) and repair kit in one. Pretty standard stuff in the FAK, and more than I would take out backpacking, because cities are more dangerous than the woods. Inside is: gauze, bandages, adhesive strips, alcohol gel, soap, duct tape (wrapped on a pen), assortment of over the counter medication, bandana, string, spare tissues, etc. 2. Swiss Army Knife (Nomad model). I've used the corkscrew and bottle opener on this knife more than any of the other tools on it. But of course a knife is an essential tool to have around, and the other tools are a plus too and have gotten good use over the years, like the tweezers and the can opener. 3. (Above the knife) Mini-Bic lighter. 5. (White bag w/zipper) Electronics bag. Plug, charger, and external battery (Anker) for my phone. Bag is a Zpacks zip-pouch in hybrid Cuben fiber, so it's very water resistant. 6. (Above electronics bag) Headphones. 8. (Above the gum) Tissues. 9. Hand cream. This is mostly for when it's colder out and my hands get drier. 10. Stainless steel spoon. I've had this same spoon in my EDC since I was a teenager. 11. Office type supplies. Various pens, a pad, and a USB drive. 12. Wet wipes. Get em free at restaurants, especially useful for parents of small kids. 13. (In small, black case) Generic, mini multi-tool. Good to have a small pair of pliers and also comes with small screwdrivers. 14. "Just in case" snacks. Cliff bar and a small packet of peanut butter. I try not to eat this unless I am (or my kids are) really hungry, then replace it right away. 15. "Just in case" toothbrush and toothpaste. 16. Current book I am reading. Pretty good so far. 17. (Above the book, orange stuff sack) Spare/extra clothing: wool socks, wool gloves, synthetic vest, and wind jacket. In the summer I nix the vest. 18. (Next to the orange bag, green stuff sack) Rain pants and Golite poncho/tarp. The poncho/tarp used to be one of my go-to pieces of UL gear for backpacking, but last year I upgraded to a better one (MLD silnylon), so the Golite replaced my cheapo rain poncho. 19. Small plastic bottle for water. Tap water in Sweden is great pretty much everywhere. 21. Emergency space blanket. Just in case, plus gives piece of mind. 22. Glowstick. Not only just in case and piece of mind, but kids also love it if it's dark out as a surprise toy. 23. (Small, round case) Earplugs. 25. 10m of nylon rope and a few mini carabineers. 26. (Above the rope) Big, black garbage bag. Great for laying/sitting on grass or moss, and has other good survival applications--carry water, stuff with dry leaves/moss/grass to make a sleeping mat, etc. 27. Foam sit mat. Combine with garbage bag for deluxe sitting in the park or in the woods to read a book or take a snack break. And in a pinch could be a tiny torso sleeping mat. 28. (Above the sit mat) A few bags, one plastic one nylon. Mostly used for food shopping and such, but also good for gathering wild mushrooms, fire wood, etc. The plastic bag is also good for waterproofing things like a book if it's really raining hard, for example. And that's it. That's what's generally in my everyday pack that I carry. Makes life run smoother, especially for someone who loves the outdoors. And I can't even remember all the times that someone, say at work or a friend, had a problem or needed a little something, and I can dig into my pack to help. Then there are last minute day hikes and trips with family and friends, lots of them. Anytime someone wants to get some fresh air and I got the time, I'm good to go. Oh, and for all you gram geeks out there, for the hell of it I weighed everything you see up there for the first time (for this particular set up), and it came out to around 3.3kg/7.3lbs. But obviously this changes a lot with with the variables I mentioned before. Hope this helps, or if anything next time someone asks me, I can send them this link. Peace out, and as always, feel free to ask questions or give feedback in the comments below or over on my blog's Facebook page.